The 4 ha care farm was developed with the specific objective of creating a farm-based therapeutic to support people with learning difficulties. Support was provided under EAFRD under measure 311 - diversification into non-agricultural activities. Walburga Siebenhofer wanted to start an independent business and had always been interested in psychology. Through her biology studies at University she researched the positive influence of animals on human beings and wanted to develop a enterprise that would support this. Some form of "care farming" was the obvious choice and there is a well established tradition of such farms in Austria, including support from the Austrian Council for Agricultural Engineering and Rural Development (ÖKL). 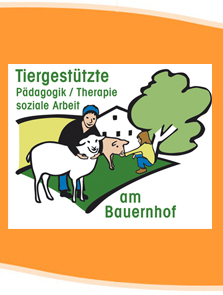 The objective of establishing the care farm was to provide "animal-assisted" therapy to help improve the quality of life of people with various disabilities. There are no products marketed from the farm. The sole focus of the care farm is upon increasing the use of "animal-assisted" therapy, facilitating access to it for a larger number of clients and to raising awareness of this specific form of therapy within wider society. The RDP funding recieved assisted with the establishment of a programme of activities, all of which are related to the specific needs of the clients and tailored to their specific situation. 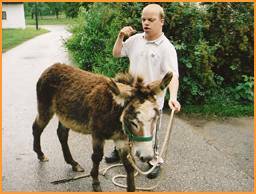 Some examples are: Donkey walking; Learning new animal care skills; Training to improve physical skills; Working with animals and people to improve interpersonal skills, and; Learning to take responsibility. The care farm clients are able to learn and carry out new exercises demonstrating improved mental and physical well being. The farm has also raised the profile of care farming and animal assisted therapy is increasingly perceived in a positive way, becoming more widely accepted. Running a "care farm" requires commitment, idealism, discipline, and persistence when working with public authorities. The owners believe the farm is highly valuable for society and the local community in particular, but does not generate much profit. The number of interested clients is growing and there is an opportunity to involve other farms to network and cooperate together.